Lineage. Established as 366 Fighter-Bomber Wing on 15 Nov 1952. Activated on 1 Jan 1953. 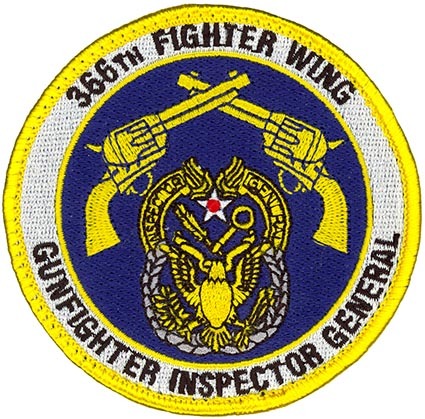 Redesignated as 366 Tactical Fighter Wing on 1 Jul 1958. Inactivated on 1 Apr 1959. Activated on 30 Apr 1962. Organized on 8 May 1962. Redesignated as: 366 Wing on 1 Oct 1991; 366 Fighter Wing on 30 Sep 2002. Assignments. Ninth Air Force, 1 Jan 1953 (attached to Nineteenth Air Force, 15 Feb 1956- 24 Sep 1957); 834 Air Division, 25 Sep 1957-1 Apr 1959. United States Air Forces in Europe, 30 Apr 1962; Seventeenth Air Force, 8 May 1962; Twelfth Air Force, 12 Jul 1963; 832 Air Division, 1 Oct 1964; 2 Air Division, 20 Mar 1966; Seventh Air Force, 1 Apr 1966; Thirteenth Air Force, 27 Jun 1972; 832 Air Division, 31 Oct 1972; Twelfth Air Force, 1 Jul 1975-. Operational Components. Groups. 366 Fighter-Bomber (later, 366 Operations): 1 Jan 1953-25 Sep 1957; 1 Mar 1992-. 401 Fighter-Bomber: attached 5 Feb 1954-25 Sep 1957. Squadrons. 4 Tactical Fighter: 12 Apr 1969-31 Oct 1972 (detached 29- 31 Oct 1972). 20 Tactical Air Support: 15 Mar-27 Jun 1972. 35 Tactical Fighter: attached 3 Apr-12 Jun 1972. 352 Tactical Fighter: 15 Aug-10 Oct 1966. 362 Tactical Electronic Warfare: 1 Feb-27 Jun 1972. 388 Tactical Fighter Training (later, 388 Electronic Combat): 1 Jul 1977-30 Sep 1979; 1 Jul 1981-15 Dec 1982. 389 Fighter-Bomber (later, 389 Tactical Fighter; 389 Tactical Fighter Training): 25 Sep 1957-1 Apr 1959 (detached 25 Sep-22 Dec 1957); 8 May 1962-15 Jun 1969 (detached 15 Sep-16 Dec 1965); 31 Oct 1972-22 Jul 1991 (detached 16 Sep-5 Oct 1976). 390 Fighter-Bomber (later, 390 Tactical Fighter; 390 Electronic Combat): 25 Sep 1957-1 Apr 1959; 8 May 1962-29 Oct 1965; 10 Oct 1966-30 Jun 1972; 31 Oct 1972-1 Oct 1982 (detached 19 Aug-16 Sep 1976); 15 Dec 1982-1 Mar 1992. 391 Fighter-Bomber (later, 391 Tactical Fighter): 25 Sep 1957-1 Apr 1959; 8 May 1962-26 Jan 1966; 31 Oct 1972-1 Jul 1990. 420 Air Refueling, Fighter-Bomber: attached 18 Mar 1954-22 Sep 1955. 421 Tactical Fighter: 16 Apr 1969-31 May 1972 (detached 23 Apr- 25 Jun 1969). 480 Fighter-Bomber (later, 480 Tactical Fighter): 25 Sep 1957-1 Apr 1959; 8 May 1962-1 Feb 1966; 10 Oct 1966-15 Apr 1959. 614 Tactical Fighter: 18 Sep-10 Oct 1966. 615 Tactical Fighter: 16 Jul-10 Oct 1966. 622 Air Refueling: attached 18 Jul 1955-1 Jul 1958. Detachment. Det 1, 612 Tactical Fighter Squadron: attached 15 May-10 Oct 1966. Stations. Alexandria (later, England) AFB, LA, 1 Jan 1953-1 Apr 1959. Chaumont AB, France, 8 May 1962-15 Jul 1963; Holloman AFB, NM, 15 Jul 1963-11 Mar 1966; Phan Rang AB, South Vietnam, 20 Mar 1966; Da Nang AB, South Vietnam, 10 Oct 1966; Takhli RTAFB, Thailand, 27 Jun-31 Oct 1972; Mountain Home AFB, ID, 31 Oct 1972-. Aircraft. F-51, 1953; F-86, 1953-1955, 1956; F-84, 1954-1958; KB-29, 1954-1957; KB-50, 1957-1958; F-100, 1957-1959. F-84, 1962-1965; F-100, 1963, 1966; F-4, 1965-1972; EC-47, 1972; O-2, 1972; OV-10, 1972; F-111, 1972-1991; EF-111, 1981-1993; F-15, 1991-; F-16, 1991-2007; KC-135, 1992-2002; B-52, 1992-1994; B-1, 1994-2002; EA-6, 2004-. Operations. Replaced the 132 Fighter-Bomber Wing in Jan 1953. Trained to maintain combat proficiency. Conducted air refueling, Sep 1954- Jul 1958. Rotated tactical squadrons to France, 1954-1956, and to Italy, 1955-1957. Served as conventional strike force in Europe, 1962-1963. Moved to the United States in Jul 1963 and converted to F-4 aircraft in 1965. Moved to Phan Rang AB, South Vietnam, in Mar 1966 for combat operations. In addition to its F-4 squadrons, also controlled several F-100 squadrons in 1966. In Oct 1966, wing designation moved “on paper” to Da Nang AB, South Vietnam, giving the 366th new personnel, equipment, and facilities. By early 1967, many of the wing’s combat missions involved flying cover for F-105 strike aircraft, offering numerous opportunities for aerial combat with North Vietnamese MiG aircraft. Wing pilots scored 18 aerial victories in Southeast Asia. In 1972, gained a squadron with an electronic countermeasures mission and another with a forward air control mission. Moved to Thailand in Jun 1972 with little change in combat missions but flew only F-4s. Moved without personnel or equipment to the United States in Oct 1972 to replace the 347 Tactical Fighter Wing at Mountain Home AFB. The 366th become operational with F-111F aircraft. In 1977, in a three-way switch of aircraft, it transferred F-111Fs to a wing in England and gained F-111A aircraft from a wing at Nellis AFB, NV. Thereafter, in addition to a wartime strike/interdiction mission, the wing also trained replacement aircrews for the USAF’s F-111A community. Acquired electronic countermeasures capabilities with addition of EF-111A radar jamming aircraft in late 1981. Operated an electronic combat range and provided mobile electronic range support for exercises held by other units. In Dec 1989, deployed EF-111A aircraft to support USAF units involved in the invasion of Panama. The 366th also deployed EF-111A aircraft and maintenance support personnel to Saudi Arabia in Aug-Sep 1990, and it conducted extensive electronic warfare operations in Southwest Asia. In the summer of 1991, the wing relinquished its F-111A aircraft and the replacement crew training role; its complement of EF-111A aircraft departed the following year. In the meantime, the 366th transitioned to the composite wing concept, beginning with the introduction of F-16C/D fighter and F-15E strike fighter aircraft in the fall of 1991, adding F-15C fighters and KC-135R tankers in mid-1992. A squadron of B-52G bombers was also assigned in Jul 1992, and these in turn were later replaced by B-1B bombers in 1994. Regularly deployed expeditionary forces to contingencies in Southwest Asia such as Operations SOUTHERN WATCH and DESERT STRIKE. Deployed three squadrons and a base support element to the CENTCOM theater to participate in Operation ENDURING FREEDOM after the 11 September 2001 terrorist attacks, as well as providing combat air patrol and air refueling assets in support of Operation NOBLE EAGLE. Wing’s mission narrowed to a fighter role in 2002. Campaign Streamers. Vietnam: Vietnam Air; Vietnam Air Offensive; Vietnam Air Offensive, Phase II; Vietnam Air Offensive, Phase III; Vietnam Air/Ground; Vietnam Air Offensive, Phase IV; TET 69/Counteroffensive; Vietnam Summer-Fall 1969; Vietnam Winter-Spring 1970; Sanctuary Counteroffensive; Southwest Monsoon; Commando Hunt V; Commando Hunt VI; Commando Hunt VII; Vietnam Ceasefire. Southwest Asia: Defense of Saudi Arabia; Liberation and Defense of Kuwait. Decorations. Presidential Unit Citations (Southeast Asia): 23 Apr-1 Aug 1967; 1 Apr-26 Jun 1972. Air Force Outstanding Unit Awards with Combat “V” Device: 10 Oct 1966-31 Mar 1967; 1 Apr 1967-31 Mar 1968; 1 Apr 1968-31 Jul 1969; 1 Aug 1969-1 Aug 1970; 2 Aug 1970-31 Mar 1972. Meritorious Unit Award: 1 Jan 2007-31 May 2008. Air Force Outstanding Unit Awards: 17 Apr 1974-15 Apr 1976; 18 Aug-16 Sep 1976; 16 Apr 1976-27 Mar 1978; 1 Apr 1984-31 May 1985; 1 Mar 1989-28 Feb 1991; 1 Mar 1992-28 Feb 1994; 1 Jun 1996-31 May 1998; 1 Jun 2001-31 May 2002; 1 Jun 2003-31 May 2005; 1 Jun 2005-31 May 2006. Republic of Vietnam Gallantry Cross with Palm: 1 Apr 1966-31 Oct 1972. Bestowed Honors. Authorized to display honors earned by the 366 Fighter Group prior to 1 Jan 1953. Service Streamers. None. Campaign Streamers. World War II: Air Offensive, Europe; Normandy; Northern France; Rhineland; Ardennes-Alsace; Central Europe; Air Combat, EAME Theater. Decorations. Distinguished Unit Citation: Normandy, 11 Jul 1944. Citations in the Order of the Day, Belgian Army: 6 Jun-30 Sep 1944; 1 Oct-17 Dec 1944; 18 Dec 1944-15 Jan 1945. Belgian Fourragere. Emblem. Approved on 3 Aug 1965.